← Ni’s First Handmade Notebook–Thank To My Dear Artist Friend Kimmie In My Art Group!! 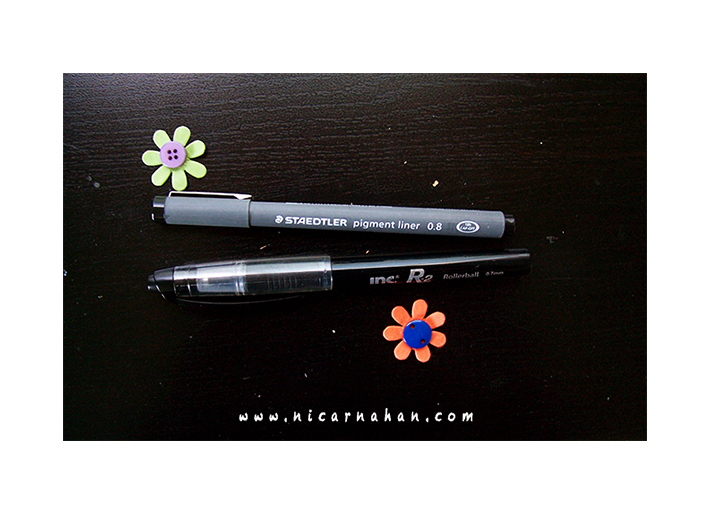 Ni’s Tools and Media Review- Pens- Black Rollerball R-2 INC. 0.7 MM and Staedtler Pigment Liners! rnahan 2013 All Rights Reserved! I love pens! They are my best friends when I sketch or create my arts. I am passionate about patterns, textures,lines,and shapes. So, I always need to have pens and sketchbooks with me whenever I go,especially a nice black roller ball pen. I have a quite selection of different types of pen that I bought in Taiwan and in U.S. over the year. I am constantly trying out the new pens that I can find. So far, there are three different type of pens that I personally love to use. 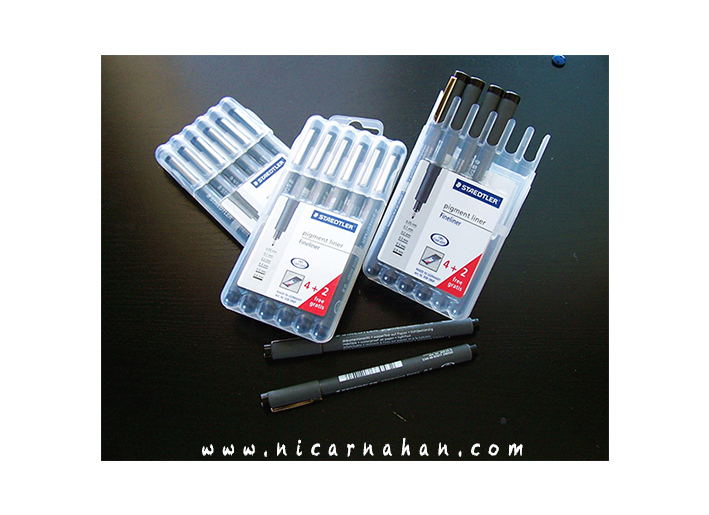 I have been using–R-2 0.7mm roller ball pen for sketches, Staedtler pigment liner and Pen&Ink for finishing works. I am going to share my humble experiences about these three types of pen with you. First of all, It is hard to find the right black roller ball pen for my use when I create. I couldn’t be happier when I found my black R-2 Roller ball pen (0.7mm). I love how easy and flow that pen has provided when I do a quick sketch. It also provide consistent lines ,controlled in-flow system,and fairly enough ink supply in my opinion. It is also depending on what type of papers you use with this pen. Comparing to most of roller ball pens, this one is also flow much easier on smooth surfaces. However, you have to be careful not to smash over the ink on your sketches as you go. You will need to be careful,especially the area that you apply multiple times. Also, I found out that I need to apply multiple times in order to get the sharp black that I need sometime for my sketches,but the black ink is decent enough. So, I have been using this pen for sketching,doodling, or using it for a quick idea layout on my sketchbooks for over 3 years now,and really enjoy using it. I tried to find more information about this pen,but there are not much to find online or on the package. I bought mine at local dollar store,and it is the only place that I can find this pen in store. Here is Dollar Tree online site where you can purchase it. All I know is it is fairly cheap (It is about one dollar for two pens as a set) ,and it give you the flow you want when you use it. I believe that it is not waterproof or acid-free ink of type for this pen as I can’t find any information about it, so I only use it on my sketchbook or a quick idea sketching. I just found out that they have 5 different colors choices now online at Dollar General website. I wish I could find out more information about this pen for you,but there really isn’t much to find online. If you do know more about this pen,please share with me and everyone. Next, let’s talk about my new favorite pen-Staedtler pigment liner!! Beside pen and ink, I have been using Micron pen by Sakura and Faber-Castell pitt artist pen. 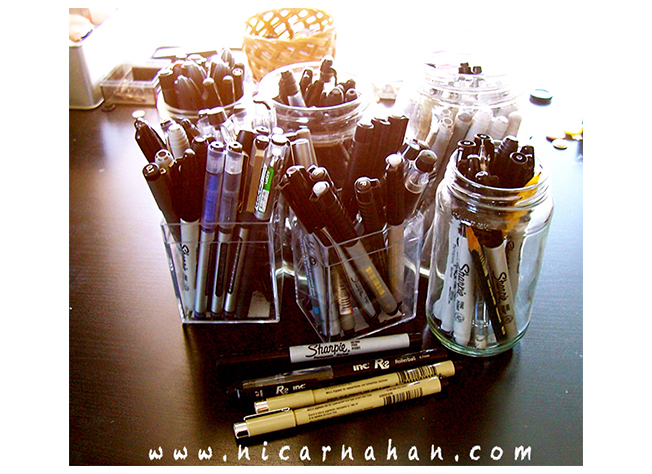 They are both nice pens,but I was looking for more durable product since I use them a lots when I create. Staedtler pigment liner has been my new favorite ever since I use it.This pen is made in Germany, indelible, waterproof on paper, light fast,and it is supposed be cap-off for 18 hours without dry out. I haven’t tried that yet,so I can’t tell you from my experience. Anyway, this pen flow well,and provide consistent lines and inks when I use it. It is fairly light pen to grab. I love how it flow on smooth surfaces,and fairly durable compare with micron pen. I often find myself broke the tips of micron pens that I have been using easily as I press pretty hard when I use the products. However, Staedtler pigment liner is much better choice for me for this matter. It is also not a very easy pens to find at stores. I bought mine at Amazon.com. The only complain about this pen is that I wish they have longer ink supplies as I use them a lots when I create. Other than that, I am pretty happy about this brand. Finally, I can’t complain about pen & ink as I love pen & ink. It gives me freedom to do whatever I want with different types of nip,and acid-free ink will always be dark enough for me. I have learned to use pen& ink when I created my Japanese comic over years ago. You should be able to find it at any art store. It has always been my favorite tool,and there is not much to complain about it personally. Now,I am going to try out different color inks with my illustration project that I am working on now to see if I can come up with something different. I still love black and white. But trying something different is always what I love to do. So, I can’t wait to try out different color inks. Anyway, my search for the perfect pens is still on,and I will continue to share my new experience with different type of pens as I go. How about you? What type of pen is your favorite when you create?